Flexible design for any space and any location. We thought it would be fun to share with you some MOSSpod designs we have created for clients over the years. Lots of you think outside the box when considering your garden room designs and this is exactly why we made the MOSSpods so flexible. We interpret all ideas to suit unique locations and we work with you to convert our designs into something special and specific to you. For every pod design, we draw up 3D models for our clients to be able to visualise the space and design clearly and we tweak it until you’re happy. We have 6 popular sizes for both the Park and River ranges on our website, but as our MOSSpods are a modular design, we can adjust the shape and size of each pod according to the space that you have. Many of our MOSSpod garden room designs have embraced this flexibility. It may be that you have a tiny nook that you want to make use of, so you may require something smaller than our regular sizes. You may want a larger, open area where you can experiment with shapes through combining several pods together. 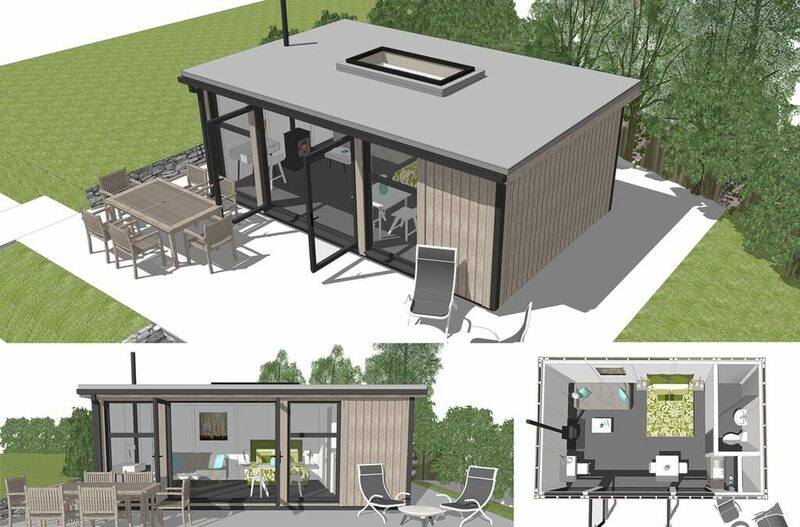 Some clients have opted for this design to create separate rooms within their pods or to make L-shaped or wrap around units that open up onto a central courtyard. It just depends on the space you have and what you want to use it for! We want our garden rooms to take advantage of everything your outside environment has to offer, whether that’s amazing views across the countryside or to fit an unusual, quirky landscape. We have designed outside entertainment spaces, creating features that maximise the benefits of the garden, such as trapping the sun for warm garden parties whilst protecting it from the elements. We have made bespoke roof overhangs and verandas to make welcome pools of shade, as well as balconies with glazed balustrading that look over sloped valleys. We love incorporating new ideas into our designs. When clients choose to have a MOSS garden room, it often means losing an old decrepit shed at the bottom of the garden: it may be a bit run down and mouldy, but it’s where you keep your tools! It’s valuable storage space that many clients are reluctant to lose, so we have designed a number of bespoke sheds to ensure this space is recreated (and your gardening equipment is much happier and drier!). We have even designed bespoke bike sheds which are tailored to keeping bikes secure and accessible. MOSSpod home extensions are one of our most popular requests because our pod designs compliment such a varied array of architectural styles and are perfectly suited to extending homes with a highly sustainable structure that exceeds current building regulation standards. Home extensions can be as innovative in design as our garden rooms: we have worked with some very unusual spaces creating designs that maximise space and fit our clients’ requirements perfectly. If you’d like to know more about how we could adapt one of our pods to suit your needs, don’t hesitate to get in touch with us below or call us on 01173 790 505. Follow our blog for tips and info on adding extra space to your home. From designing through to planning, material considerations through to landscaping and interior design. We’ll also describe previous and current projects in detail to give you inspiration for your own projects. Drop us a line on 01173 790505 or Email us to start conversations about your home improvement ideas. Feel free to contact us with any enquiry about our products and service. We are very happy to provide further information and can also arrange an initial design consultation meeting to advise on your ideas and site. I would like to receive MOSS’ latest product launches, exclusive mailing list offers and news. I would like to receive MOSS’ latest product launches, exclusive mailing list offers and news. MOSS Design will not pass on or share your information with any other company or party. Your information will only be used to keep you up to date on our activities and products and your details will be stored in a secure database, which only MOSS can access. You can unsubscribe at any time.